Do you have a bunch of Android and iOS devices? I would assume for the majority reading this, the answer is a resounding ‘Yes.’ Tired of the mess of wires and all the space your devices take up while charging? (I live in a 1BR apartment in downtown Baltimore, so you can imagine my answer). If you answered ‘Yes’ to either of these questions, then the Kickstarter project Arq, brought to you by Houston-based 2040 design studios, may be the answer for you. 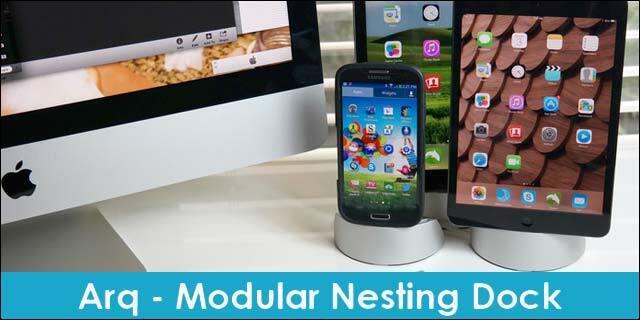 The Arq is the first nestable dock that provides the ability to charge multiple devices within a small footprint while offering the flexibility of arranging in groups or using individually. To give you an idea of just how small the footprint is, each Arq Dock measures 1.845 inches deep, 4.028 inches wide and 1.38 inches tall. It works with both iOS and Android devices and has been designed with the ability to accept either Lightening or Micro USB charging cables, which can be easily swapped out. Due to the ability of being able to adjust both connector height and back support, the Arq is able to work with devices even while they are in their cases, including Life Proof cases. Also because the connector height is adjustable, the device always sits on the Arq with no weight on the connector. The Arq uses nano micro suction pads on the bottom that keep the dock firmly anchored to smooth surfaces for easy one-handed undocking as evidenced by the video below. For those who are interested in the Arq, you can head over to Kickstarter to make a pledge and help Arq become a reality. Pledges start at $35 for 1 Arq and go up to $155 for 6 Arq Docks.